An isosceles triangle is a triangle whose two sides are congruent. 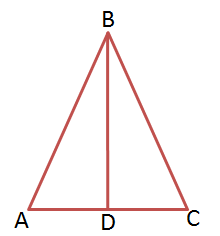 In the figure below, is an isosceles triangle and . The Isosceles Triangle Theorem states that the angles opposite to the two congruent sides of an isosceles triangle are congruent. In the figure above, the theorem states that since , . The proof to this theorem uses the SSS triangle congruence. 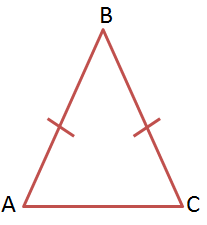 The SSS Triangle Congruence Theorem states that if the three corresponding sides of two triangles are congruent, then the two triangles are congruent. The angles opposite the two congruent sides of an isosceles triangle are congruent. Let be the midpoint of . Now from the given and the definition of isosceles triangle, (S). By the SSS congruence theorem, . Since corresponding parts of congruent triangles are congruent, and we are done. In the first line of your proof, it should be “Let D be the midpoint of AC”, not “AB”.